With multiple layouts and smart customization options, you can create a stunning magazine or digital content website in minutes.Baseline makes it super easy to showcase your best content to your visitors with a stunning Featured Content Carousel. Showcase up to 10 of your featured posts in an elegant, responsive carousel at the top of your homepage. Simply add a tag to your posts and it will be included in the carousel automatically. Baseline features a flexible, responsive design, meaning your site will scale to fit any screen size, from desktops down to mobile phones. All pages and features have been optimized to work on every device. 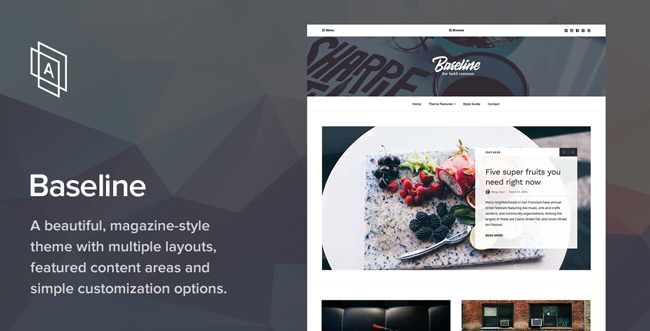 Every template included with Baseline features flexible, expressive styles for typography, images, galleries and more, allowing you to easily create engaging content.